"Every Russian regime since 1991 has to a greater or lesser extent recognized the importance of having a strategic orientation focused on the West. ... We are witnessing a rejection of the Western-democratic paradigm set back in the 1990s, which somehow survived from over 20 years. ... It is a paradigm of Russian civilizational inferiority, certain that it can only evolve by copying Western standards, gradually becoming a 'normal European country." 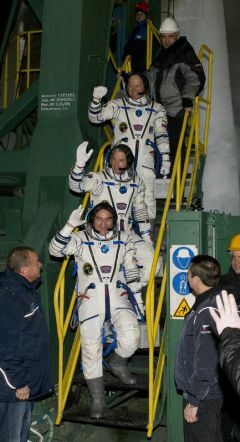 Russian cosmonauts Aleksander Skvortsov and Oleg Artemyev, and American astronaut Steve Swanson, prepare to blast off to the International Space Station in a Soyuz rocket, March 25. Like the science fiction film 2010 a Space Odyssey, NASA announced today that it is suspending much of its work with Russia over the crisis in Ukraine, although Space Station cooperation will continue. Social networks these days are seeing an unprecedented influx of alarmists foretelling that because of Western sanctions, seven of the Ten Plagues would soon fall on our heads and will affect absolutely everyone. Retirees are afraid that "the shortages will be as bad as they were in the USSR." The creative class is concerned that "we'll have to use the beaches of Murmansk." Businessmen and officials both fear "our assets will be confiscated." For those not yet terrified, warnings of apocalypse abound, such as "complete international isolation," a "new Iron Curtain," and the "disintegration of the country." Practically speaking, this mass psychosis looks mysterious. One need only read a collection of quotes from Western heads of state to understand that the "international community," out of whose orbit we are supposedly about to slip on our descent into hell, is doing everything it can not to overreact. The currently approved package of sanctions is, even to me, an ordinary Russian citizen, somewhat inconvenient. It's the human thing. However, it is one thing to freeze with great pomp the bank account of a famed oligarch like Yelena Mizulina, and quite another to stop buying Russian oil. But even if the inconceivable happens - and it’s hard to imagine the West ripping the shirt from its chest and suddenly demolishing all trade ties with Moscow, no economic apocalypse will occur. There will be no repetition of the shortages and decline of the late 1980s. China, Japan, Korea, and India, in principle, produce the range of goods that we currently obtain from the West, and they are more than ready to buy raw materials. What’s more, the Russian economy is a far cry from the dull system of planning and distribution that existed at the sunset of the Soviet Union. Moreover, a certain degree of isolation from imports that easy oil money has attached us to would rather be to our advantage. What then, for example, worries people like Boris Nemtsov, from whose predictions one imagines an anti-utopia? I can share one observation to help explain the psychological underpinning if what's going on. To my astonishment, one well-known Kremlin critic, whose column I regularly read, recently changed his approach on the sensitive topic of officials with foreign assets. Instead of rebuking them as "thieves," he began to advise them not to quarrel with the West over Crimea in order to keep their villas and bank accounts. It was obvious that in this new political situation, the presence of corruption is perceived more as a positive thing, as it gives the West a chance to put added "pressure" on the Kremlin. But the officials haven't heeded the advice. They declared Crimea a part of Russia. In his last column the author was genuinely perplexed: What's happening in the country, when officials don’t even care about their villas? What motivates them now? It seemed to me that our author was concerned not over the inconvenience that sanctions would bring, but that, incomprehensibly to him, a new and utterly unknown system is taking hold, in which the old truths no longer adequately describe reality. 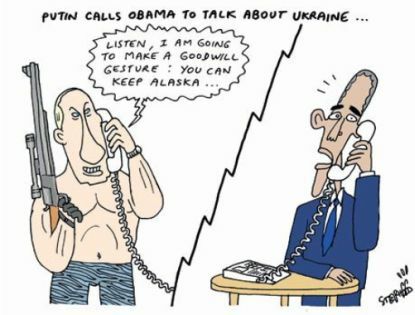 The classical Russian liberal worldview is built almost entirely on a black and white dogma. Slogans like, "the private is more important than the public," "the market drives the economy," "the state is bad," "all officials steal," "Russian people are lazy and submissive," "Russia is the worst place to live," and "the West is always right," are kind of a like having a set of colored glasses one takes on and off depending on the subject. Only all of a sudden, the looking glass shows something odd. It turns out that officials are prepared to give up their beachside villas for something quite intangible. Tens of thousands of people with tears in their eyes rejoice that they now will live in Russia. Reality is changing too fast and has come into sharp conflict with the fixed worldview locked in the liberal's head - hence the subconscious anxiety behind all the talk of hundred rubles for the dollar and the new gulag. When one begins to understand the reasons for the rapid shift in the reality we live in, it becomes clear that for Boris Nemtsov and other pro-West political commentators, causes of concern can only multiply. I believe we are witnessing a rejection of the Western-democratic paradigm set back in the 1990s, and which somehow survived from more than 20 years. It is a paradigm of Russian civilizational inferiority, certain that it can only evolve by copying Western standards, gradually becoming a "normal European country." Every Russian regime since 1991 has to a greater or lesser extent recognized the importance of having a strategic orientation focused on the West - despite many tactical differences. That's why our liberal movement, even having spent many years in the opposition, consider themselves by nature bearers of the ultimate truth about the global order. They are the "guru" against which no other political force can compete intellectually or ideologically. Rejecting a Western-centered view of the world (Putin's last speech in the Kremlin was official confirmation) deprives those who favor the West of this informal but extremely important social status. Moreover, what's happening now in the former Soviet Union will lead to new political forces with greater vitality, which will be harder to compete with than aging Duma deputies. Physical separation from the West doesn't bode well for them. It means the loss of a trusted ally, who for two decades has invariably helped with support, funding, and a kind word. Under certain circumstances, this support could well be converted into real political influence. Changing the rules of the game usually hits those who established those rules. Any assertions of Russian civilizational independence and separation from the West will inevitably weaken our pro-Western liberal movement. What is perhaps most striking is that some of the movement's leading representatives are focused on reviving in the public mind Russia’s "secondary" role in world history. Yuliya Latynina, for example, presented in the pages of Novaya Gazeta the following thesis: through the development of technology alone, the West proves its civilization supremacy (above all, Latynina is inspired by the creation of devices like the iPhone), and attempts by "totalitarian regimes" (including Russia) to make "cultural values" a core tenet of their civilization are just pathetic attempts to hide their own wretchedness. Realizing the futility of responding to these kinds of arguments, I will nevertheless remark that in the early 1940s, the most technologically advanced government in the world was Nazi Germany, and the processing of human material in the death camps was carried out by the latest technology.